Our house is situated on the slope of Table Mountain with a beautiful view over the City Center and the Ocean, accessible thru 2 electronic security gates and guarded by our 2 friendly dogs Dana and Trixi. Very quite area, one of the oldest suburbs of Cape Town, centrally located, close to beaches, many restaurants and shopping centers. The birds will wake you up in the morning, your breakfast can be enjoyed from your garden area with a view over the city. WE (Austrian and Nord-German) live in Cape Town for over 40 years and consider ourselves Capetonian. We bought our property 28 years ago for the view and enjoy it every day. You can enjoy this view from your garden area . Quite area in walking distance to the lower slope of Table Mountain and the Cable Station. Close to My City bus route. Close to City Center on the slope of Table Mountain. Walking to the City trough the Company Gardens takes you approx 20. downhill - the return trip takes you uphill - therefore longer. Walking to Table Mountain - close to our house. This is a comfy apartment in a great, safe, neighborhood, with excellent views . The place is clean and organized, and Christl is a friendly and helpful host. Stunning view in arguably one of the nicest locations in Cape Town. 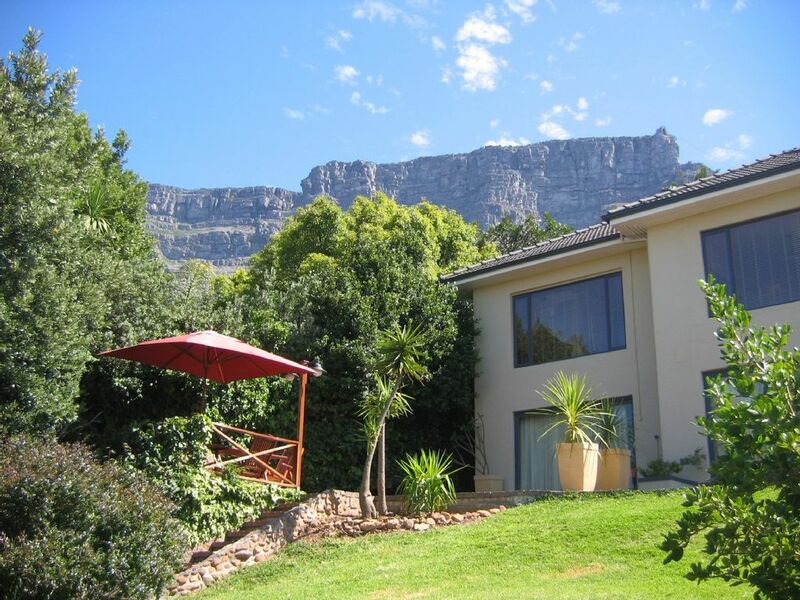 The property sits high up at the foot of Table Mountain and overlooks Table Bay. Close to the Cable Car station and Camps Bay. Restaurants and shops are in abundance. Downtown city center is a short 5 minute Uber ride away. The house itself has all the required amenities. The hosts were wonderful and we loved their dogs. We will definitely stay here again. Property has a great view nestled at the foot of Table mountain. Very good security. Very helpful hosts- great WiFi- and close to all significant site seeing - particularly cable car up Table Mountai. One suggestion for improvement is a fan to help move air through the apt when it’s warm. We had a really great time - facilities more than adequate in a very nice neighborhood. Wir haben uns bei Christel und Eckhard Seemann in Kapstadt sehr wohl gefühlt! Die großzügige Wohnung hat eine wunderbare Lage. Alles ist gut zu erreichen, das Viertel sehr gepflegt und sicher, zudem ein sehr äbeeindruckender Blick auf die Stadt! Besonders aber hat uns der nette und persönliche Kontakt zu unseren Gastgebern gefallen! Danke und wir wuerden uns freuen Euch wieder zu sehen. Der perfekte Ort um Kapstadt zu geniessen! Wir fanden ein liebevoll eingerichtetes Apartment mit sehr netten Gastgebern vor. Der Blick von der Terrasse auf Kapstadt ist bei Tag und erst bei Nacht ein Traum. Das Garden-Einkaufscenter liegt in der Nähe und lässt keine Wünsche für den täglichen Bedarf offen. Auch einen deutschen Metzger mit sehr guter Wurst und anderen dt. Leckereien gibt es dort. Schnell erreichen Sie den Tafelberg und die Beaches in Camps Bay und Cliffton. Wir kommen sehr gerne wieder in dieses Guesthouse bei unserem nächsten Kapstadtbesuch. Preisangabe für 2 Personen - jede weitere Person Euro 17 Max. 4 Personen. Längere Aufenthalte (mehr als 4 Wochen) auf Vereinbarung. Endreinigung Euro 25.00 Preiseangabe fuer Langzeit Mieten in der Nebensaison fuer 2 Personen Euro 1200.00 pro Monat - mehr als 2 Personen lt. Vereinbarung Endreinigung Euro 25.00 Abholung vom Flughafen - auf Wunsch - Preis auf Anfrage.